DUBAI, United Arab Emirates -- Troops in a Saudi-led coalition captured a town south of Yemen's port city of Hodeida on Thursday as fierce fighting and airstrikes pounded the area, officials said, on the second day of an offensive to capture the strategic harbor. The U.S. military, meanwhile, sought to distance itself from the offensive, led by key ally and U.S. arms buyer Saudi Arabia, after months of warnings that the battle for Hodeida could put hundreds of thousands of civilian lives at risk. The Saudi-led coalition backing Yemen's exiled government launched an assault on the port city of Hodeida on Wednesday. The Red Sea port is the main entry for food into a country already on the brink of famine. The U.N. has said some 600,000 people live in and around Hodeida, and warned that "as many as 250,000 people may lose everything - even their lives" in the assault. With that backdrop, the U.S. sought to make it clear on Wednesday evening that it was, "not directly supporting the coalition offensive" on Hodeida. "The United States does not command, accompany, or participate in counter-Houthi operations or any hostilities other than those authorized against AQAP (al Qaeda in the Arabian Peninsula) and ISIS," Pentagon spokesman Maj. Adrian Rankine-Galloway told CBS News in a written statement sent Wednesday evening. "U.S. military support to our partners is always geared towards mitigating noncombatant casualties," he said. "Our support to the (Saudi) Coalition consists of aerial refueling to Coalition aircraft and intelligence support to assist our partners in securing their borders from cross-border attacks from the Houthis." While the U.S. is not playing a direct combat role in the Hodeida offensive, it comes about a year and a half after President Trump signed a multi-billion-dollar arms and economic deal with the Saudis in a move intended to strengthen the U.S.-Saudi Arabian alliance. If the deal is carried out in full and certain conditions are met, it could be worth almost $350 billion. In 2016, Saudi Arabia imported $3 billion worth of U.S. arms, more than any other country. Major U.S. defense contractors lauded the deal signed in 2017 as their stock prices rose in its wake. 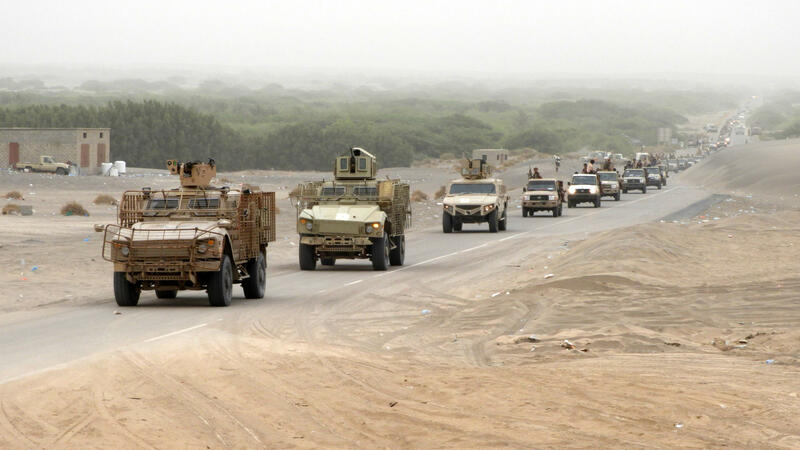 Saudi coalition soldiers on Thursday took the town of Nakhila in Yemen's ad-Durayhimi district, some 12.5 miles south of Hodeida International Airport, according to the government-run SABA news agency. Fighters continued to move closer to the airport in fighting Thursday. Early on Wednesday, convoys of vehicles headed toward the rebel-held city as heavy gunfire rang out. The assault, part of an operation dubbed "Golden Victory," began with coalition airstrikes and shelling by naval ships, according to Saudi-owned satellite news channels and state media. Forces loyal to Yemen's exiled government and fighters led by Emirati troops had neared Hodeida in recent days. The port is some 90 miles southwest of Sanaa, Yemen's capital, which has been in Houthi hands since September 2014. The Saudi-led coalition entered the war in March 2015. The port has remained open, however. Several ships arrived in recent days, including oil tankers, and there was no word from the coalition or the U.N. to stop work, according to a senior port official, who spoke on condition of anonymity because he was not authorized to talk to the media.